The First Congress of the Republic of Texas, meeting in Columbia in December 1836, though it advisable to alter the design of the first official flag of Texas, adopted in May 1836. David G. Burnet, the first president of the Republic of Texas, suggested that Texas’s official flag be an azure blue with a single gold star in its center. Gammell’s “Laws of Texas” Volume 1, page 1132, quotes the resolution which was passed by this first Congress creating this flag. This resolution was enacted and signed by Ira Ingram, speaker of the House, and Richard Ellis, president pro tem of the Senate, and is dated December 10, 1836. It also carried the signature of the president, Sam Houston. While it was the official Texas flag until 1839 when the Texas flag of today was adopted, it was seldom referred to and no record of where or when it was displayed has been noted. This flag, adopted several months after the de Zavala flag, was probably adopted as a simplification of the de Zavala standard. The two flags were much alike. 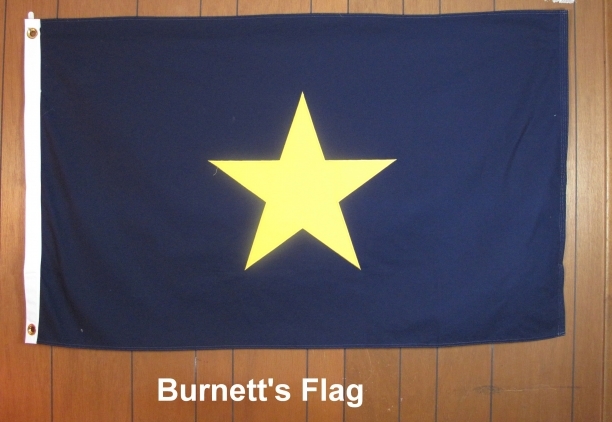 However, the Burnet flag’s huge five-pointed star was of gold, or yellow, instead of white and the lettering T-E-X-A-S was omitted. The young Texas Republic was governed, in its early period, by patriotic men, but men who had had little experience in government. Consequently, they often had a change of mind and ideas. This accounts for the official designation of both de Zavala’s and Burnet’s flags, and the fact that neither was ever known to be publicly displayed. 2'X3' cotton, cut & sewn. Satifaction guaranteed. Fully refundable for 10 days upon receipt.